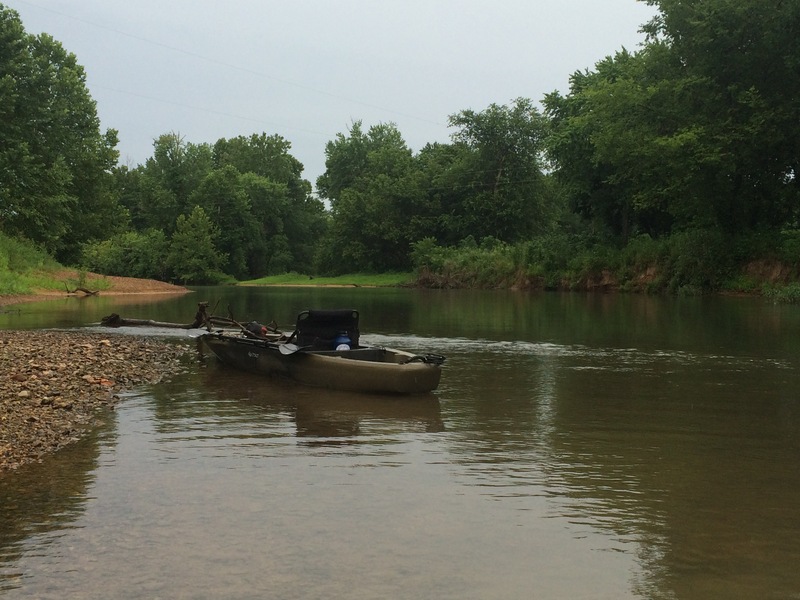 With all the rain we had in the past week the Harpeth River was high and muddy when fishing time came around, so the target waters were switched to the Buffalo. 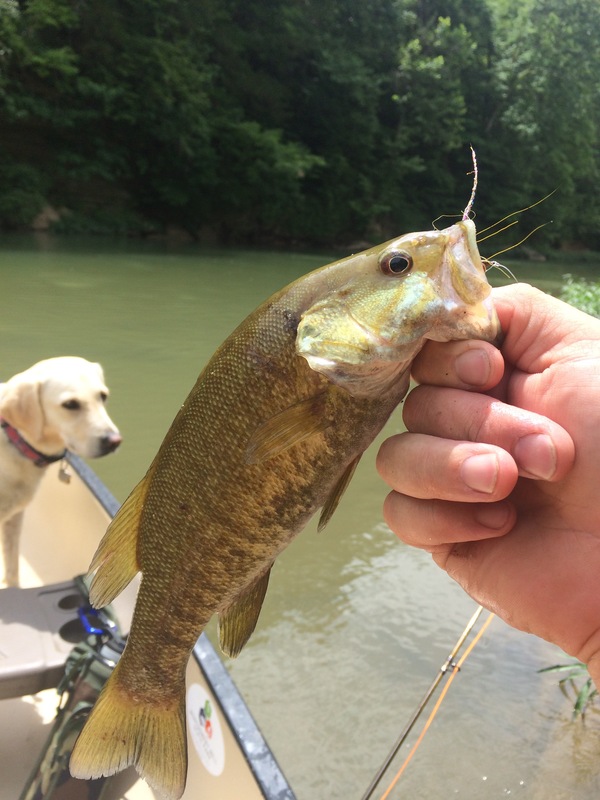 At the first thought of fishing the Buffalo, daydreams of smallmouth destroying a fly and wreaking havoc on their way to the net fill my mind. But wait. There’s all that rain we talked about, and the mind then reverts back to the way storms usually come in from the west and muddy up the Buffalo River before doing their thing here. As luck would have it this time around, the weather came in more from the Northwest, and the Buffalo remained at perfect levels and clarity For both anglers and boaters alike. A steady rain greeted us as we unloaded the boats on the gravel bar, but the radar said we had a break coming. I started out swinging for the fences with hopes that a big fish would nail the massive popper I tied on, while Jonathan stayed true to the crawfish pattern that we all know and love. Right away the crawfish was producing and the popper was striking out. The early action was slow and sporadic at best, but the late morning brought us to one of those really fishy-looking Rock ledges: the kind that dreams of monster bass are made of. Between the lack of success with the popper and the promise of fish holding deep on the rocks, I followed Jonathan’s lead and tied on the biggest, heaviest crawfish I had in the box. Next was getting the right drift, followed by a few casts with nothing. OK, time for an adjustment. Drift in closer to the rocks and make a parallel cast, whoa. Just missed that branch with the back cast, maybe I should pay attention. Never mind that, the fly is in the water. Let it sink, yep – it’s in the zone now, strip, strip, BAM! 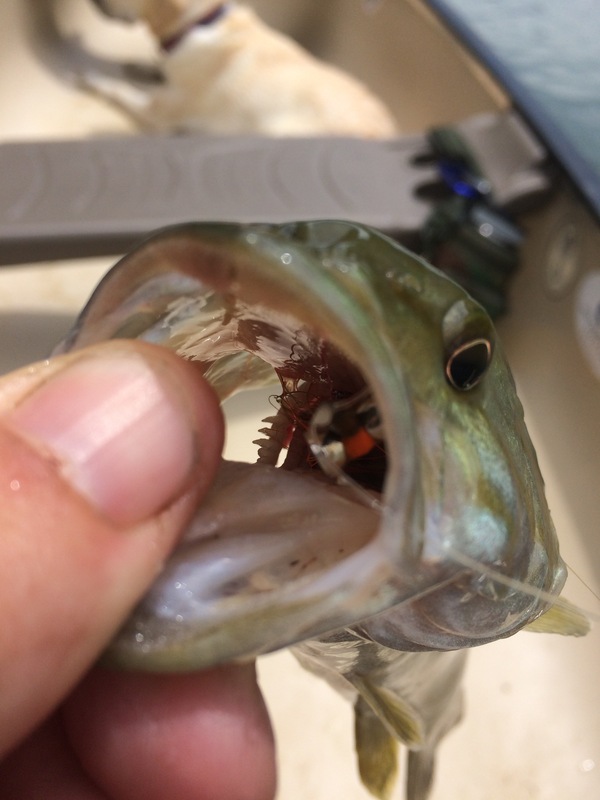 (There’s nothing like the feeling of your fly stopping abruptly in the water and you know you’re not hung up). A good hook set and the fish thrashed like only a smallmouth can. A quick glimpse of those bronze shoulders and a flash of the belly was all the show I would get before the fish broke me off. Any angler knows that feeling I had, the one right before you throw up and you just slouch forward in the boat to wonder what might have been. No worries, I have another one in the box. Tie it on, paddle upstream, get the drift right, here comes the cast….right into the aforementioned tree. One of those limbs that’s too high to reach from the boat, and just out of reach from shore. Jonathan’s turn, he’s a lefty, so hopefully he won’t hit the branch with his angle. Wrong – now we have two crawfish flies in this tree and Jonathan decides we can’t live with that. I like his style. I’ll spare the details of getting from kayak to the bank against the ledge, but success was found in the disembarkment. The real problem was the height of the branch. We need to bend this thing down. Enter the dock line and a nearby rock tied to it. It goes without saying that a comedy show ensued with two guys and a yellow lab trying to manipulate a branch we couldn’t reach, but we got one fly back and we’re happy to continue on with a 50% success rate. We never did close the deal on any big smallies, but the average ones we did hook onto put on quite a show as only they can. It was a subsurface kind of day for them, but they were a little hung over from the weather and didn’t wake up until late morning on this outing. 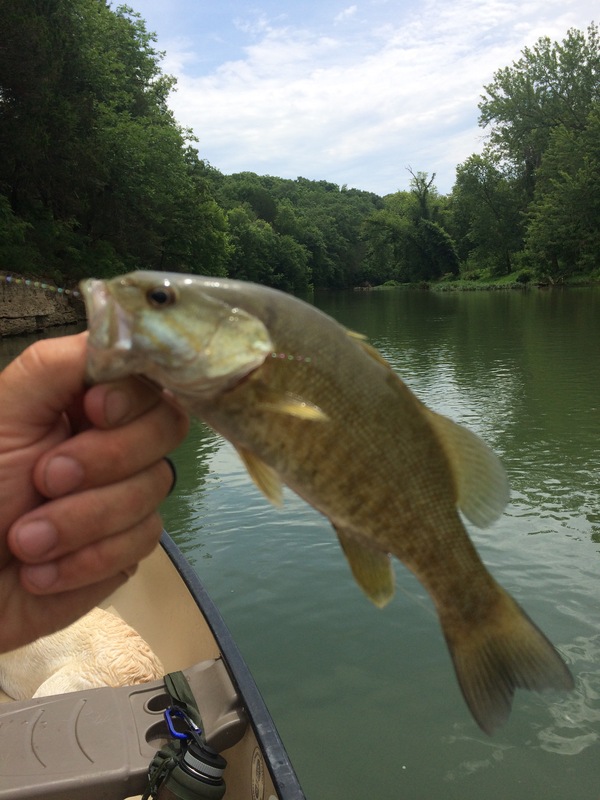 If you have some smallmouth water near you, don’t hesitate to chase these aggressive fish and experience the thrill of the bronzeback for yourself! As always, have a great time and leave the water cleaner than you found it!